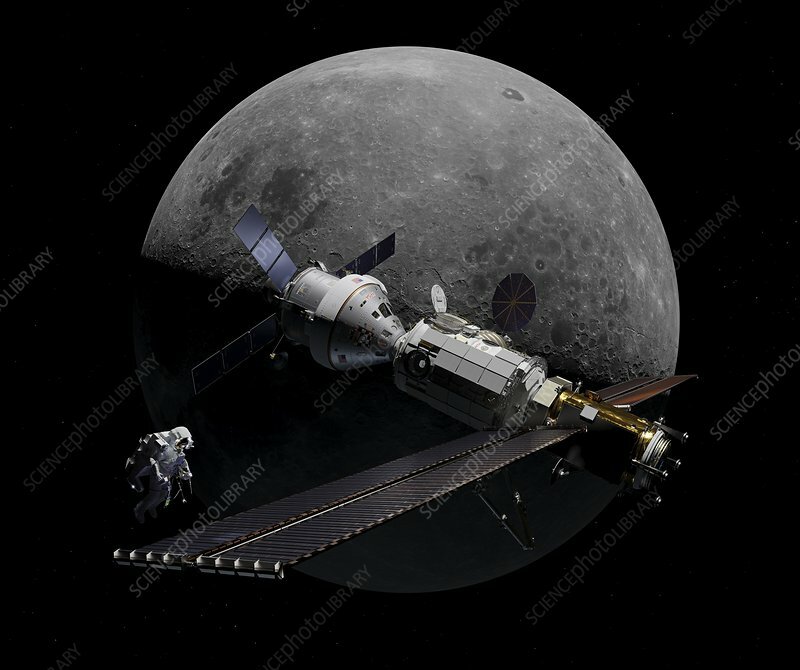 Illustration of an astronaut flying an untethered Manned Maneuvering Unit (MMU) near the proposed Lunar Orbital Platform-Gateway, a manned moon-orbiting space station. The space station components include, from left to right, the Orion Multi-Purpose Crew Vehicle, a manned habitation module, and the Power and Propulsion Element ion propulsion module. Attached to the habitation module, and mostly hidden from view is a Cygnus Enhanced automated cargo spacecraft. The solar voltaic panels have a total length of 53 meters. The total length of this configuration is 25.5 meters. Attached to the habitation module on the right is a Cygnus Enhanced automated cargo spacecraft.